Fushimi Inari Shrine, located in southern Kyoto, is one of the most important Shinto shrines in Japan, dedicated to Inari, the Shinto god of rice. 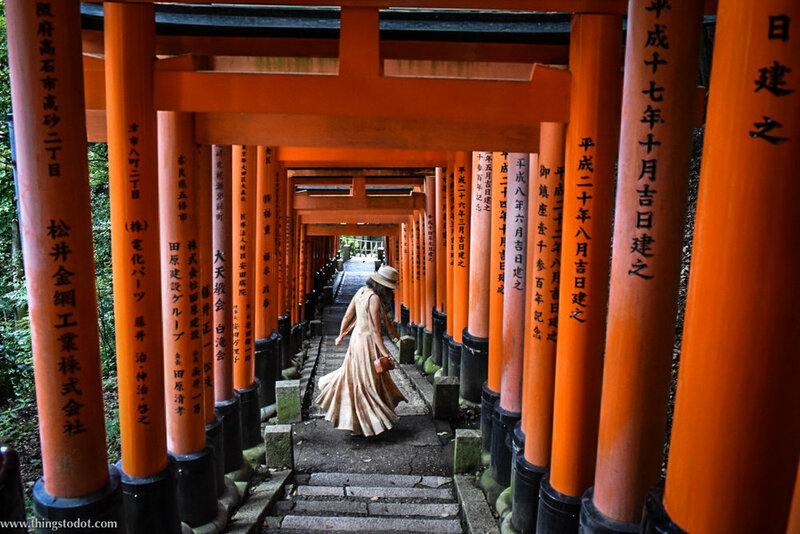 Thousands of vermilion torii gates create a labyrinth of trails that lead into a wooded forest of the sacred Mount Inari, standing at a height of 233 meters above sea level. There are many fox statues across the shrine grounds as they are regarded to be Inari's messengers. Visiting the Inari Shrine was one of the most important highlights of my trip to Kyoto besides the Arashiyama Bamboo Grove and the Kinkaku-ji temple. I met my tour guide at the JR Inari station, located just outside the Inari Shrine at 8:30 a.m. We wanted to start early to avoid the tourist rush. The torii gates of the shrine are one of the most popular tourist attractions in Kyoto and can get very crowded. I had only two hours and we decided to do a part of the hike through the torii gates trail. The trail starts from the very back of the temple grounds. The hike to the summit of the mountain and back takes about 2-3 hours. However, we went only as far as the Yotsutsuji intersection, that offers a good view of Kyoto. Most tourists usually hike only to this point. It took us about an hour and a half to reach the intersection and hike back to the temple. I also enjoyed walking around the temple grounds and my guide taught me the Japanese way of offering prayer at the shrine.